Medals by Italian artists of the fifteenth and sixteenth centuries, arranged by region and broadly divided into Renaissance (until 1530) and High Renaissance (post-1530) groups. Medals by Italian artists of the seventeenth and eighteenth centuries, arranged by region and including the resurgence of the cast medal in Florence. Medals of the popes from the fifteenth and sixteenth centuries, arranged chronologically by reign. Medals of the popes from the seventeenth and eighteenth centuries, arranged chronologically by reign. Medals by French artists and of French style from the sixteenth through early eighteenth centuries, arranged chronologically by artist. 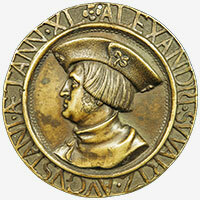 Medals by German artists from the sixteenth century. Medals from the Dutch Golden Age. Medals struck in France for the early United States to honor notable patriots of the Revolutionary War.